We, The Book Doctors, travel the country going to writers’ conferences, book festivals, bookstores, libraries, colleges and universities where writers meet and learn how to get successfully published. We kept hearing about the University of New Mexico Summer Writers’ Conference in Santa Fe (formerly the The Taos Summer Writers’ Conference) and how freaking awesome it is. We finally got a connection, reached out and lo and behold, we are excited to announce that we will be presenting at this year’s conference, July 24-31, in Santa Fe, New Mexico. One of the best ways to go from being a talented amateur to professionally published author is to be around a bunch of professionally published authors. There are few places you can do this outside of writers’ conferences like this one. Whether it’s learning the craft of plotting a novel, understanding how to shape your life into a memoir, or figuring out the nuts and bolts of how to navigate the stormy seas of publishing, there’s just so much to learn and so many brains to pick. Plus, we’re totally psyched about going to Santa Fe. New Mexico will be our eight-year-old daughter’s 34th state. What’s not to love about that? If you’re there, please look us up and say hello. 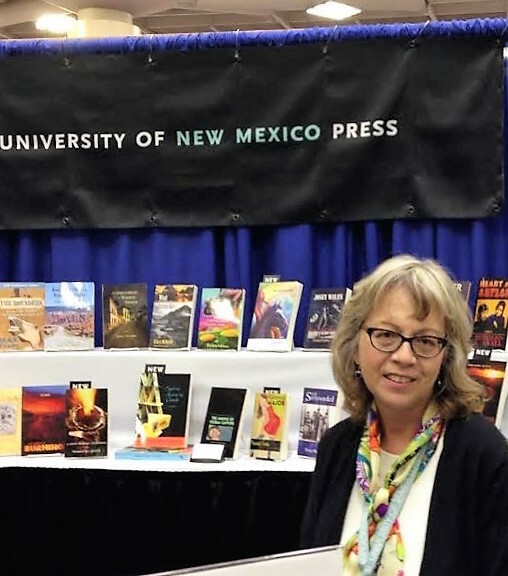 We spoke with Sharon Oard Warner, founding director of UNM Summer Writers’ Conference in Santa Fe, about the conference, reading and her advice for writers. Sharon Oard Warner: My first favorite book was The Little Red Caboose, a Little Golden Book. My dad swears he read that book to me a hundred times or more. I do remember loving it, so much so that when my own sons were small, I bought them a ginormous version, so big that my younger son could hide behind it, which is the only real purpose the book served. As might be expected, The Little Red Caboose just didn’t do it for my sons. After seeing the gift book titled Everything I Need to Know I Learned from a Little Golden Book, I began to wonder about the long-term impact of my childhood obsession with The Little Red Caboose. Had I been marked for life by the book’s message? It turns out, yes, I had. TBD: How were you marked for life by your childhood obsession with The Little Red Caboose? SW: In order to get the attention he craves–the waves and cheers of children–the caboose has to come to the rescue. In other words, he has to put on the brakes and resist mightily the forces of gravity and the weight of all the other cars bearing down on him. He has to save the train. Off and on throughout my life, I have been defiant in the face of forces larger than I am. I have thrown on the brakes and stubbornly resisted being moved. Right now, I am trying to save the D. H. Lawrence Ranch, and I am reaching out to other writers for assistance. Anyone out there want to help? SW: Reading, first, last, and always. TBD: How did moving around so much affect your childhood? How did it affect your writing? SW: I went to twelve elementary schools–two a year through sixth grade–and all of these schools were in the Dallas metropolitan area. In first grade, I was outgoing, exuberant even, but by third grade, I kept to myself. Rather than make friends with children I would soon say goodbye to, I turned to books for my support and solace. I checked out stacks from the school library and from whatever public library was in walking distance of my home. I read every moment I wasn’t otherwise engaged. TBD: How has teaching writing made you a better writer? SW: As I said earlier, I learned to write by reading. However, most of what I’d absorbed in all those hours of reading was largely instinctual. I couldn’t articulate it for others. I couldn’t analyze it for myself. Teaching, then, required me to deepen my understanding in order to share what I knew with others. Case in point: Like many graduate students, I was a teaching assistant, which meant instructing a freshman writing class. Grading essays is the most time-consuming part of teaching such a class, and for me, grading was arduous. I could rewrite my student’s work, but I couldn’t correct or critique it. Because my schooling was so haphazard, I never learned the fundamentals of grammar. Once I recognized my deficiency, I was forced to address it. I had to learn or relearn subject/verb agreement, pronoun reference, sentence faults, dangling participles and so forth. Teaching has often taught me what I don’t know, but never more forcefully than in my first year at the front of the class. By the way, teaching requires social skills. I had to shrug off my introversion and relate to my students. TBD: Why did you start the University of New Mexico Summer Writers’ Conference in Santa Fe? SW: When I started the conference, it was held in Taos, and it was called The Taos Summer Writers’ Conference. My reason for creating the conference was simple: I wanted to make a connection between the University of New Mexico (UNM) Creative Writing Program in Albuquerque and the D. H. Lawrence Ranch outside of Taos, New Mexico. I have been advocating for the property for many years now, but the success of the conference has not really brought attention and support to the ranch, not yet, anyway. TBD: What can writers get from attending the conference? SW: Our goal is to create a nourishing literary community for writers, one in which everyone can form lasting relationships and create great work. A number of writers who first attended the conference as participants have gone on to publish their work and build writing careers. Some of them have come back years later as instructors: Summer Wood, Laura Dave, Frances Washburn, Laura Brodie, Richard Vargas, and Margaret Wrinkle, to name a few. TBD: What have you learned from your years of being involved with the conference? SW: So much, but what comes to mind is this undeniable fact: Many of us have compelling, important stories to tell, stories that should be/need to be shared with others. It’s been my pleasure and privilege to assist in the storytelling endeavor, first as a reader and as a writer, and later as a teacher and as founding director of the UNM Summer Writers’ Conference in Santa Fe. TBD: What projects are you working on now? TBD: What advice would you give to writers? SW: Finish things. Life is full and it’s easy to lose track of projects you’ve set aside. Only this morning, while looking for a place to make notes on these questions, I discovered a journal full of jottings for a story called “The Last Bee.” As soon as I finish the screenplay, I’m going to return to the story, which is about the plight of our honeybees. Sharon Oard Warner is Professor of English and Associate Chair for Undergraduate Studies in the English Department at the University of New Mexico. She is also Founding Director of UNM Summer Writers’ Conference in Santa Fe (formerly the Taos Summer Writers’ Conference) as well as Co-chair for the newly formed D. H. Lawrence Ranch Initiatives. She has published four books–a collection of short fiction, Learning to Dance and Other Stories; an edited anthology, The Way We Write Now: Short Stories from the AIDS Crisis; as well as two novels, Deep in the Heart and Sophie’s House of Cards. Her stories have been published in Prairie Schooner, The Laurel Review, Other Voices, Green Mountains Review, and elsewhere. Her scholarly essays have appeared in Studies in the Novel, Studies in the Short Story, Best Writing on Writing, The Writer’s Handbook, and in selected anthologies. She is currently completing a screenplay.